Underground water distribution pipe failures occur commonly across Australia. External loads, internal loads and corrosion are the main contributers to cast iron pipe failures. Pipe replacement after failure is conducted as fast as possible and failure mechanisms are only briefly documented. The extent of corrosion in exhumed cast iron pipes were collated. Pipes failures which did not lead to a major burst (leaks and no pipe failure) were examined. 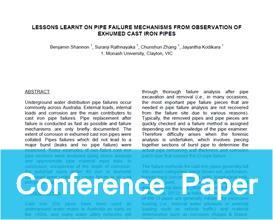 Some examples of non-failed cast iron pipe sections were analysed using stress analysis and approximate pipe material input data. In conclusion, irrespective of the depth of corrosion, the patch/pit sizes under 40 mm in diameter examined were unlikely to cause failure in all cast iron pipes tested.